This censored and registered cover was sent to New York City. There are three St. Pierre et Miquelon CDS. There is also an octagonal boxed R and script 639 for registration. There is a straight-line PASSED BY CENSOR ____ handstamp which has been initialed by DB/104. The cover is undoubtedly philatelic. This is one item for which expert opinion would be mandatory. "The circumstances surrounding the overprinting and distribution of these stamps were most unusual. Practically all of the stamps [were] issued in small quantities, with the exception of 260-299, and were obtained by speculators within a few days after issue. At a later date, the remainders were taken over by the Free French Agency in Ottawa, Canada, by whom they were sold at a premium for the benefit of the Syndicat des Oeuvres Sociales. Large quantities appeared on the market in 1991, including many "errors." More may exist. "Excellent counterfeits of these surcharges and overprints are known." 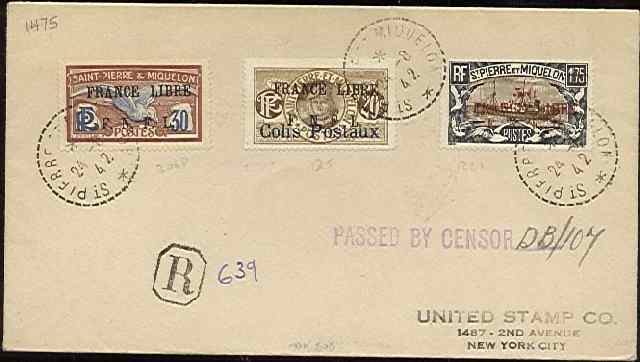 All three stamps have received a FRANCE LIBRE | F. N. F. L. overprint. The F. N. F. L. is the abbreviation for Forces Navales Francaises Libre or Free French Naval Forces. All were issued in 1942. The first stamp with the overprint is the 1925 30c. red brown and blue Fulmer petrel (Scott 206D). then overprinted with the France Libre overprint (Scott Q5). The third stamp is the 1933 black and dark brown fishing steamer and seagulls design surcharged 5 fr. There are bars over the 1.75 fr denomination. Further, the France Libre overprint comes from a different type setting (Scott 221).